San Francisco: hills, public transportation, walking, more walking....Although I spent my first 3 months here trying to tromp around the city in my LaLa Land heels, I have succumbed to wearing flats 80% of the workweek. Well what type of flats, you might ask? Ones with fierce pointed toes, of course! Don't get me wrong, this girl loves her a ballet flat, but when it comes down to office attire, something about a sharp toe says "I mean business" that more slipper like looks don't quite get across. P.S. Those Loeffler Randall's (#3) will be MINE! Those Kate Spades will be mine at some point! I've had my eye on them for a long time. Wow I love numbers 5,1,3. Xoxo V.V. love the ones with the coral tip! Great feature on flats! I am especially fond of the Christian Louboutins! I am now following, would love it if you would check mine out and follow back if you'd like. Very nice blog, #5 rules!! :) Take a look to mine, if you want to... we might follow each other? Same problem in Sydney! Heels just kill my feet from having to walk around so much so these days I'm living mostly in flats too! L-O-V-E #5!! Oh my gosh, loving the #3 ones. Great round up! I bought a pair of coral & tan flats at Marshalls while in Florida last week, can't wait to wear them!! There's a peek of them on a recent I did... http://www.desiretodecorate.com/ Have a great day! I love love love those studded silver ones! Beautiful! These are beautiful! Flats are always on my list of Spring wants. Love the coral toe pair! 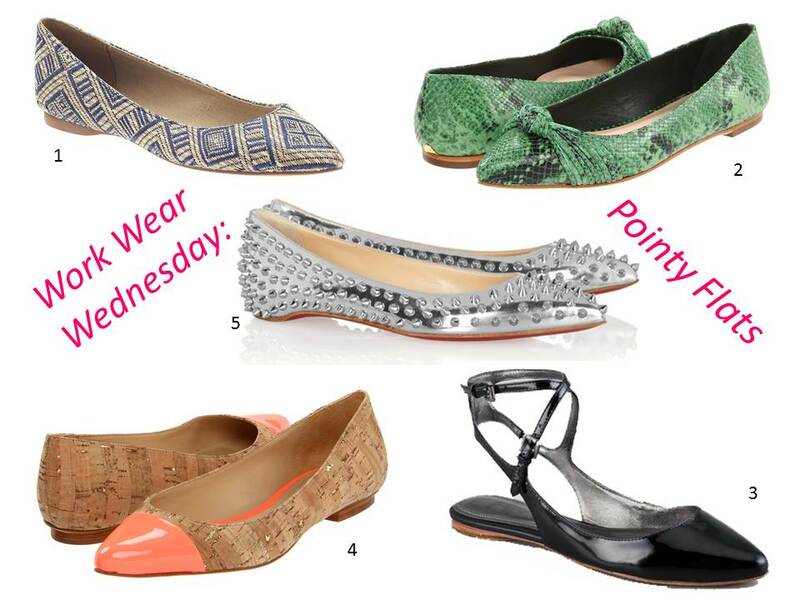 I agree, a fierce pointy flat at the office is a must!